ArjoHuntleigh Maxi Sky 1000 unit with 4 point hanger bar. 1000 lb safe working load. 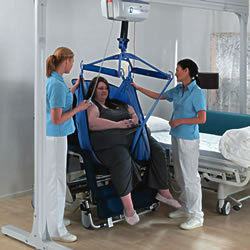 Maxi Sky 1000 allows safe, comfortable and dignified transfers of bariatric residents. The sophisticated ceiling lift system allows a single caregiver to perform transfers of bariatric residents under handset control without stress or strain and with no manual lifting. The lift cassette can be installed on a semi-permanent gantry or a permanent ceiling-mounted straight track. A full range of bariatric loop or clip slings can be attached to the four-point sling bar. Price for Maxi Sky 1000 Ceiling Lift Unit does not include track/installation components/slings/installation. From a single cassette unit with a unique bariatric designed spreader bar, which simplifies operation by the caregiver, giving the capability to handle all passive lifting situations! The unique wide space design and angle of the spreader bar attachment points, allows the individual to be lifted in a comfortable position. You can have a choice of a ceiling mounted track system or a portable gantry rated to 1,000 lbs giving you the flexibility to meet any requirement. The unit is always ready for use. After transfers, the lift cassette is returned to the clip-on charging station, which can be positioned anywhere on the track (automatic return to charge is an option). Several features – a brake, lowering system and pull-cord emergency stop – safeguard the client in the event of an emergency. A current limiter prevents the lift use if the battery is low to maximize battery life. Cassette lateral speed and spreader bar height is programmable from the hand control. The electronic soft-start and soft- stop makes it easy for the caregiver to ensure the lift can always be stopped smoothly and safely exactly in the required position. A red light on the lift cassette alerts the caregiver when servicing is required. Due to the modular design, replacement components are simply snapped into place. Please Note: The Adaptive Living Store and the Manufacturer, ArjoHuntleigh require that the installation of Fixed Ceiling Lifts and their components is performed by a Certified Trained Technician. Maximum distance between supporting structures: 79"
Maximum distance between supporting structures: 118"
Height from floor to ceiling 82-118"
Unit weight (batteries included): 48 lbs. Strap length up to 90"
Lifting speed: 1.2"/sec. at 1000 lbs., 1.6"/sec. at 500 lbs., 2.8"/sec. at 0 lbs. Adjustable horizontal displacement speeds: 4, 6, 8, 10"/sec. Preset at 8"/sec. Automatic return to charge function initiated by user (optional): weight sensor cut-out 20 lbs.